STEP 1 – Each day starting with cleansed skin, you use the dermal roller by going over each area of skin ten times in both a horizontal and vertical direction. At first I found this a little strange, not painful, just a little tickly across the skin, but soon got used to it and happily tried to do this most days before applying the serums. By rolling the micro needles across the skin, tiny holes are made allowing the serums to penetrate deeper into the skin and also boosts your own collagen renewal. STEP 2 – Then apply the Wrinkle Clear Growth Factor Serum which comes in an easy to dispense pump bottle. I just used two pumps and rubbed between my fingers before massaging into the face. This is a light, easily absorbed serum that feels gentle on the skin and is simply to apply. 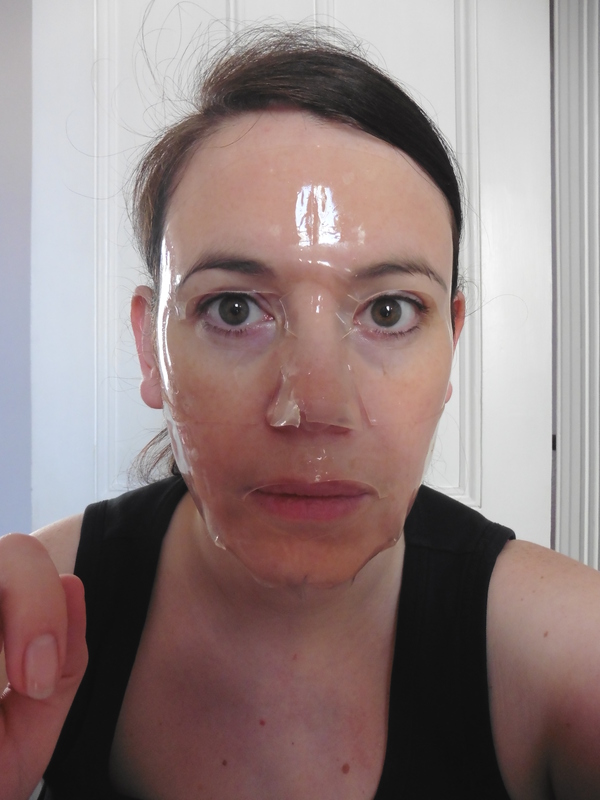 STEP 3 – Once or twice a week you need to apply the Collagen Growth Factor Face Mask. This is a clear gel like sheet that you peel off a backing sheet and place on your face. It easily smooths around the contours of your face and adheres with the serum on it. I found this quite relaxing and an ideal time to put my feet up for 30 to 40 minutes whilst the serum soaks into the skin. You can also dissolve the remaining mask afterwards in hot water and massage the resulting serum into your face for a further hydrating boost! STEP 4 – After the mask, it’s time to apply the Super C15 Serum, which comes in a glass bottle with a pipette style applicator as only a few drops of this super strength serum are required. On the days you don’t use the mask, just apply this straight after the Wrinkle Clear Growth Factor Serum. I have to admit that the first time I applied this I noticed a tingling feeling all over my face, it wasn’t unpleasant, just unexpected. This did die down though over the next few days and now I hardly notice it. So how did I find the routine? I thoroughly enjoyed giving my face a little bit of pampering time each day rather than just slapping some moisturiser on in a rush. I found the skin roller to be quite therapeutic and it felt like it was doing my skin some good. Adding the serums to my face is nice as you are left with soft, smooth feeling skin afterwards. I could easily continue with this routine everyday as it really doesn’t take long once you know what you are doing. The mask obviously takes longer but it is relaxing and I tried to use it when the children weren’t around so I could lay down for half an hour and chill. Do I notice any difference in my skin? I definitely think my skin looks brighter and more radiant, my pores seem more refined and my face feels very soft and smooth. I do think my fine lines do look a little plumped and smoother than before and I’m definitely feeling more confident with my skin. I have some deep grooves at the top of my nose between my eyebrows and these have definitely relaxed a little. My skin tone seems to have evened out and fingers crossed I have been blemish free for the last few weeks. The serums really help give my skin a youthful glow, exactly what I need as I prepare to turn 40 in a few days time!! Thanks to the SkinPep® 4 Step Growth Factor Vampire Collagen Treatment for giving my skin a pre birthday boost as I hit middle age! 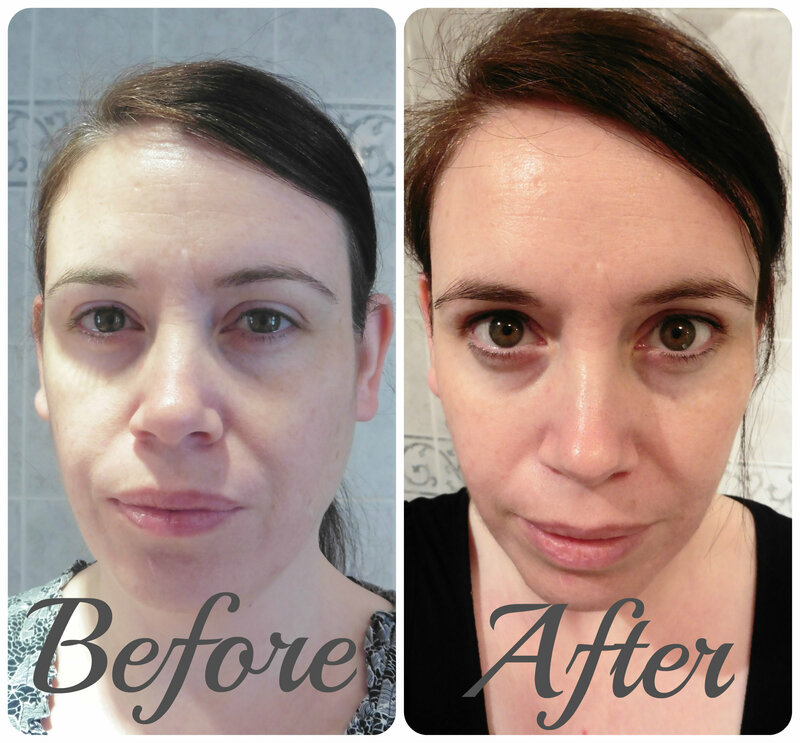 This entry was posted in Beauty Reviews, Reviews and tagged anti ageing, collagen, face, skin, skincare, skinpeps, vampire by Fiona Martin. Bookmark the permalink. This kit look awesome! It is like a proper pamper kit that give you everything! It does seems a lot of work to do everyday. I have not tried clear mask before. This mask look amazing! These sounds like some serious piece of kit but easy to use. You can definitely see a difference in your skin. Hope you have a great birthday! I think you’re looking lovely. The set does look very complete for your face, and a lovely excuse to sit down for 49 mins to let the mask do it’s good work.